On Friday, Abi kissed our minivan good-bye, and we handed over the keys. Our 2004 Sienna needed $1500 worth of repairs ($3000 if you asked Toyota themselves), but was worth $2000 in trade. Not bad for a vehicle with over 210,000km on it. It was a faithful ride, and carried us smoothly down both coasts of the US. The DVD player upgrade was well used, and the leather seats made for easy clean-up of pretty much every kind of liquid a toddler can produce. But it was time to say good-bye. 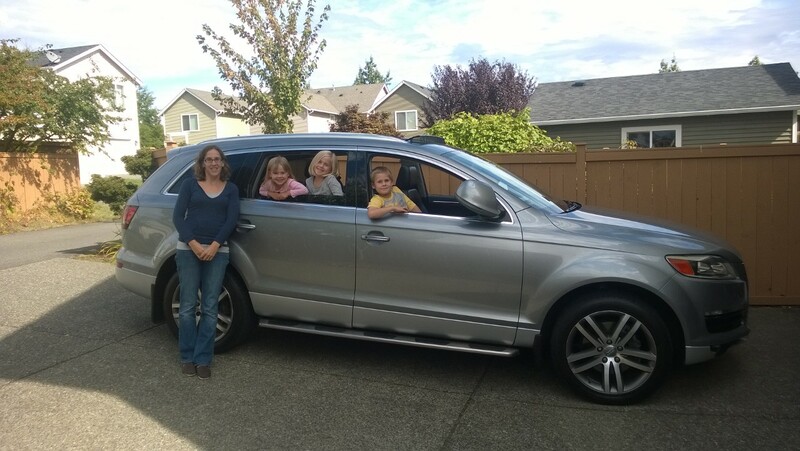 In its stead, we bought a 2008 Q7. No spring chicken itself, but so incredibly well equipped, comfortable and powerful, that we’re willing to put in the TLC necessary to keep it on the road at least as long as the Sienna. Our friend and mechanic gave it his thumbs up, save for the tires — which we were able to convince the dealer to supply (even after I took them for a pretty favorable deal already!) and we’re looking forward to breaking it in on our first road trip this weekend: a slightly early Thanksgiving celebration with family in Alberta.